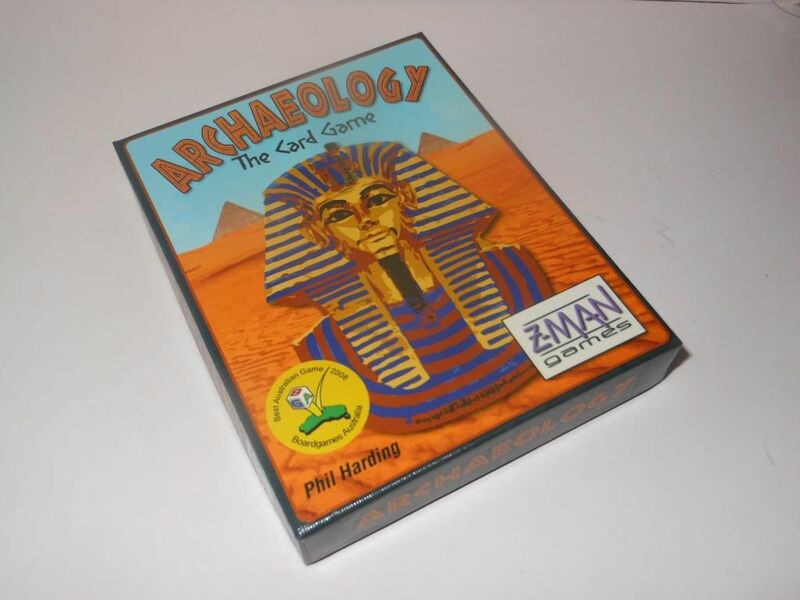 Archaeology is a game that, when I first heard about it, didn't really interest me. It's a card game about excavating treasure in Egypt. It just didn't sound like my sort of thing: The theme didn't appeal to me much, and I am not a huge fan of card games. However, when it came to looking for some light games to play with non-gamers (and gamers), which could also be played two-player, I started thinking about this game and eventually took a risk with it. I'm glad I did. The game consists of a deck of 72 treasure cards, depicting various items you can find. You also get a set of "special" cards consisting of sandstorms, thieves, maps, and a pyramid. The cards are decent quality, if a little thin, with a nice linen finish. Unfortunately, the artwork on the cards is awful; and this was another reason why I was dubious about the game - it just didn't look that professional. BUT, when a game is this much fun, who gives a flying fig what the artwork is like? You set up the game by setting aside all the special cards and shuffling the pack, then you deal four cards to each player (maximum four players). You then deal five cards face up to the middle of the table to be the marketplace. Finally, you add cards face down beside the pyramid card (one stack of three cards, one stack of five, and one stack of seven). You then shuffle the thieves, maps, and sandstorms into the deck. Note that the number of sandstorms used is adjusted based on the number of players (more on this later). During your turn, you draw one card from the deck. If it is treasure or a map you add it to your hand, if it is a sandstorm or thief you play it immediately. 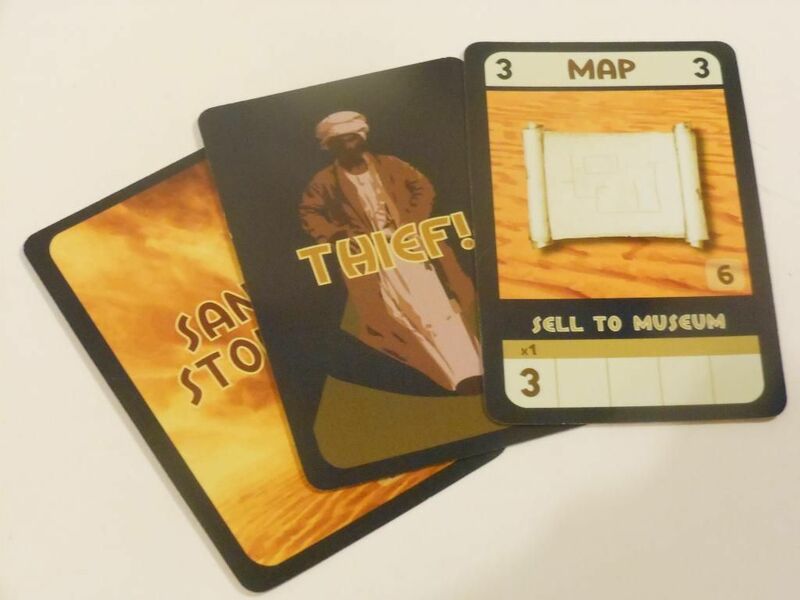 A thief allows you to randomly steal a card from another player, and a sandstorm forces every player to place half of their cards in the marketplace (the player who drew the sandstorm then draws another card from the deck and continues the turn). After drawing a card, a player can do as many actions as they want or are able to. Each treasure card has a trade value, and a museum price. You can trade cards at the marketplace using the trade value (for example, you could play a card with a trade value of 3 to the marketplace in order to take a card valued 1 and a card valued 2 from the marketplace). You can do this as many times as you want, and the aim is to get complete sets of cards which are worth more when you sell them to the museum. A complete set of talismans - no, not the talismans from that other game. 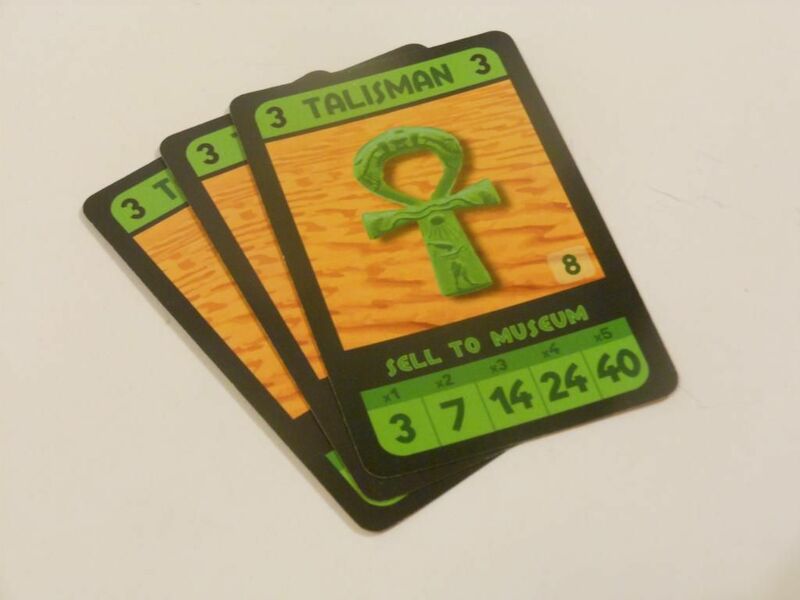 You sell to the museum by playing the cards face up in front of you from your hand. The more cards of the same kind you play, the more you will get. For example, a shard of a cup is worth 2 points, but if you sell two cup shards at the same time (thereby piecing together one complete cup) the price soars to 15 points. Some sets are easy to complete and worth only a few points, and some sets are harder and worth more. You can sell incomplete sets if you want (for less points) but you cannot subsequently add to that set later. This means it pays to hold on to cards until you have enough for a decent amount of points, although then you run the risk of having cards stolen or blown away to the market by a sandstorm. Once sets are played to the museum they are "safe" and will count towards your final score. The maps add another element to the game. They are worth 3 in a trade, or they can be sold to the museum for 3 points. However, they can also be discarded from the game to take cards from the pyramid. If you discard one map you can take the stack of three treasure cards, if you discard two maps you can take the stack of five treasure cards, and if you discard three maps you can take the stack of seven cards. There are only six maps in the game, so saving up enough to get the big stack of pyramid cards isn't easy, but it can dramatically change the course of a game if you can do it. And that's it really: Build sets, play them to the museum, person with the highest score wins. It plays much better than it sounds, trust me! Of course, like so many card games, you are basically just moving cards from the deck to your hand, then to the marketplace and back again, in order to complete sets; but this is so much fun thanks to the way the deck is constructed. For example, a coin is worth 2 points; but if you get a set of 5 it is worth 30 points. However, there are only 14 coin cards in the deck, making it impossible to get three complete sets, so if three people are all collecting coins, one person is going to be disappointed. Keeping an eye on what has been played, and what you think other players have in their hands, is vitally important. Also, knowing when to cut your loses and play an incomplete set is key to victory. The maps can cause a lot of issues. You will want to keep the maps to visit the pyramid, but if three maps have already been discarded and you have one map and think someone else has the other two, it is a huge amount of fun to sell your map to the museum, just to annoy them. It's a very simple and elegant game with a lot more decision-making than you might first think. Sometimes, in order to complete a set, you will need to trade cards to the marketplace knowing that another player at the table is collecting those cards. Is it worth letting someone complete a set of coins (worth 30 points), just so I can pick up a parchment that will allow me to complete a set (worth 10 points)? Sometimes you will be sitting on several incomplete sets, reluctant to do any trading because you suspect that by doing so you will allow someone else to complete more powerful sets (sets that you can't complete yourself because they have the cards in their hand!). You never feel like you have a good hand, you never feel like you are winning, and yet you are having a great time. Having said that, I have to admit that the first time I played this game with my wife, she hated it. Sandstorms were cropping up all the time and every time she was about to complete a set, a sandstorm would destroy her hand, or I would draw a thief and take the card she had just spent ages waiting for. In a two player game you are supposed to use six sandstorms, and this was just too much for her. She complained the game was chaotic and random and just silly. She said their shouldn't be any sandstorm cards. Some of the "beautifully" illustrated cards from the game. I explained to my wife that the sandstorms were an important element, as without them it would be much easier to complete sets, and certain cards would never appear in the marketplace. She agreed the game would probably be a bit stale without a certain amount of chaos. Our solution was simply to reduce the number of sandstorms used from six to three. The change was amazing. My wife started to love the game - she was now relying on her skill and judgement to create sets rather than blind luck. When a sandstorm appeared it was a rare and freak occurrence that hurt us both, but didn't completely destroy the hard work we had put into forming our hands. For anyone who thinks this game is too chaotic, try reducing the number of sandstorms. It's a matter of personal taste, but for me it saved the game. Now my wife wants to play this game all the time, whereas it originally looked like it would just end up sitting on the bookshelf gathering dust. Overall, I strongly recommend this game to anyone who likes light card games, especially if you are in a situation where you have some non-gamers around, as everyone can quickly understand how this game works. Yes, it's a light filler; yes, the fickle hand of fate can deal you a bad hand or a string of sandstorms, or a thief can steal your best card; but this game is pure fun. And it actually plays really well with two, three, or four players. A truly fugly game (that's fun but ugly, to you). Recommended.